Status: offline Still a great AAR xhoel. 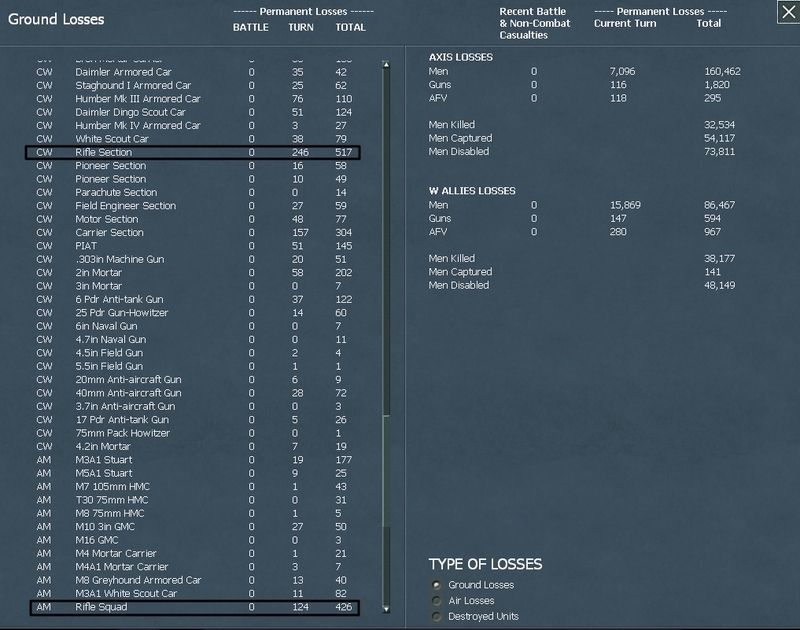 It's shaping up to be my all time favourite WITW AAR. I check it every few days and I'm genuinely disappointed when I don't have a new post to read. 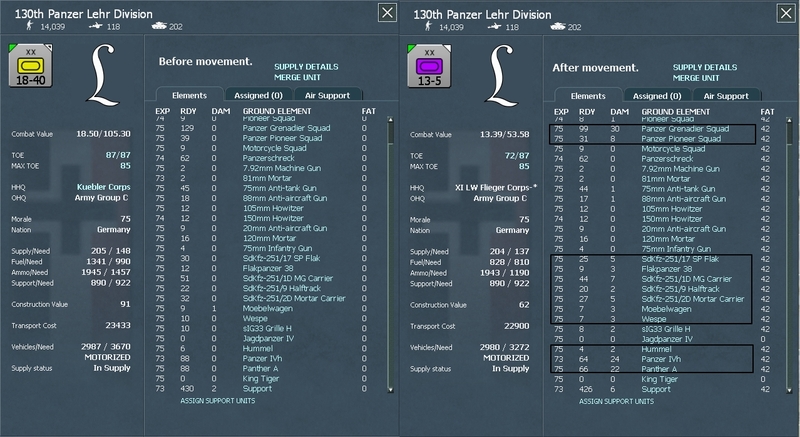 I really do like the AAR that much. Your writing is great. Great AAR with all the pictures. Unless im reading this wrongly there seems to be very little tactical use of the allied airforces? The way I see it, the allied air forces are simply stretched thin. They are running heavy air superiority directives over the beachheads and all over the shipping lanes. Add to that heavy naval patrols, airfield and rail bombings and you aren't left with much to use tactically. Still a great AAR xhoel. Yeah we are a bit slow on the turns but I try my best to be done with them as soon as possible. Real life gets in the way quite often though. Now that the invasion has finally happened there will be a lot more action and things should get more interesting! Status: offline In Puglia where there is not contact it seems the Allies are defending in clear ground and I suspect that they could be very thin. Maybe if you stalemate the landing it could be possible a counterattack to destroy the Foggia airfield complex and all planes based there. Status: offline Thanks for the comment, glad to hear that you are enjoying the AAR. I have been thinking about that quite a lot actually, but last time we had good recon on Puglia the enemy had 2 divisions stationed there. 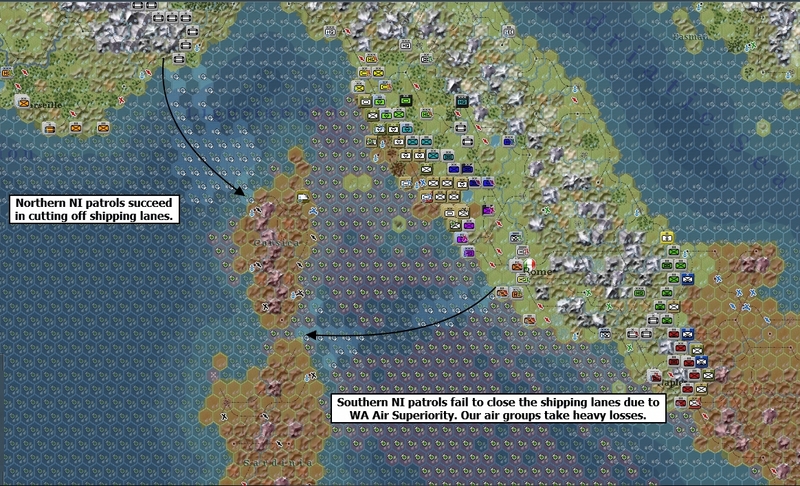 How we proceed from here depends a lot on whether we can force the WA to a stalemate in the Piombino sector. Destroying the airfields and the air groups there would be a very nice Christmas present though! The enemy resumed the air offensive over Germany last week. RAF Bomber Command hit the Ruhr heavy industry and resource production centers hard during the night. The British have once again changed their tactics. Instead of the usual small raids of 16 bombers without fighter cover, they are now throwing massive formations of 500+ bombers together, escorted by a high number of night fighters (around 200). 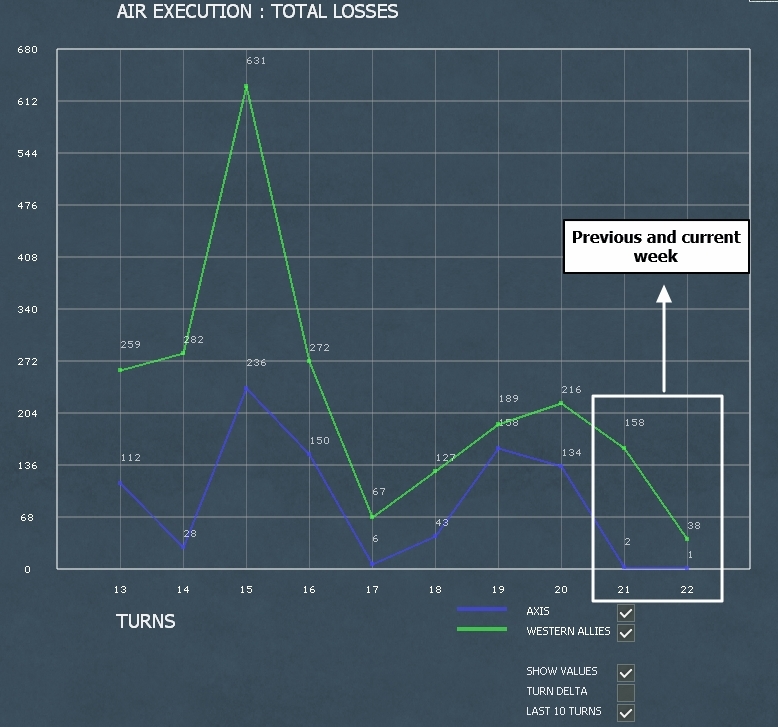 This is causing problems for our night fighter formations, and losses have mounted. 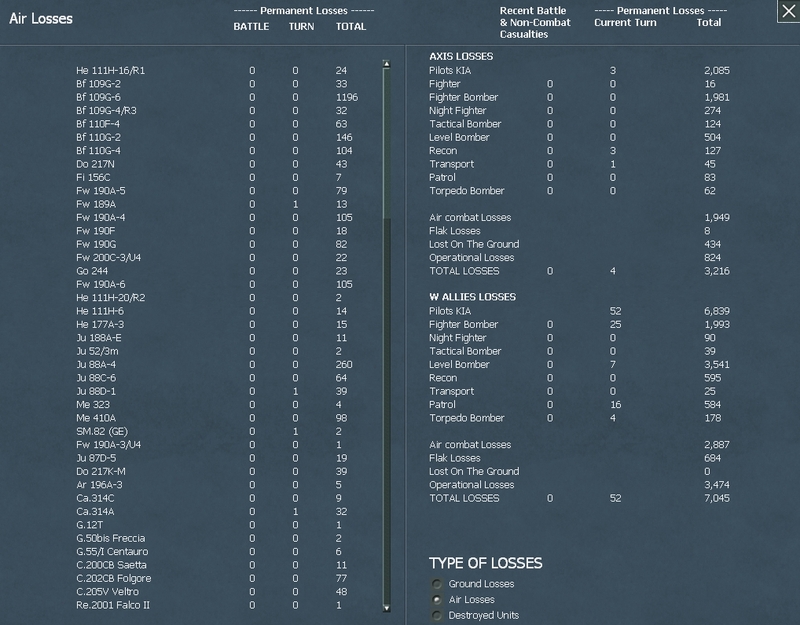 Last week we lost 35 night fighters in the defense of the Ruhr industry. The 8th US Air Force also hit these targets during the day with their 4E bombers considerably increasing the damage and making the factories much harder to repair. Because our day fighters have been deployed further inland, the Americans only had to contend with the heavy AA fire. The 8th US Air Force has also used their 2E bombers to hit Belgium and NE France. The enemy hit 3 of our airfields in Central Italy this week (Tarquinia, Rieti, Marcigliana) causing damage to the infrastructure, destroying around 26 bombers on the ground and killing a high number of support personal (around 2k men from destroyed air support elements). Our bombers continue to be pulled back from Central Italy and are being relocated north where our fighters are able to guarantee their safety. Except for air recon, no other missions were conducted by our air forces in Italy, which continue to be on R&R. Circled in yellow, battles where the enemy was held back, in red air field bombings and in black battles which we lost and were forced to retreat. The enemy launched 6 attacks last week in an attempt to break out of the beachheads. All but one of them failed. Casualties are high. New infantry divisions are arriving in the theater and the arrival of the 14th Army HQ has improved administrative and logistic matters considerably. 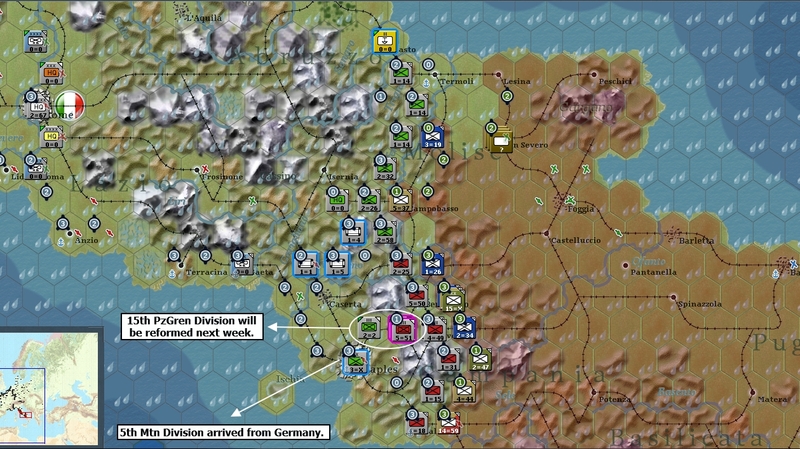 The enemy renewed its effort to break out of the beachhead in the north, attacking the positions held by the elite HG Panzer Division twice with overwhelming numbers (4 infantry divisions). In both cases the attack was stopped cold in its tracks and the enemy has suffered heavy losses. The first assault was repelled by a timely counterattack of the 12th SS PzGren Division which was in reserve north of Siena. 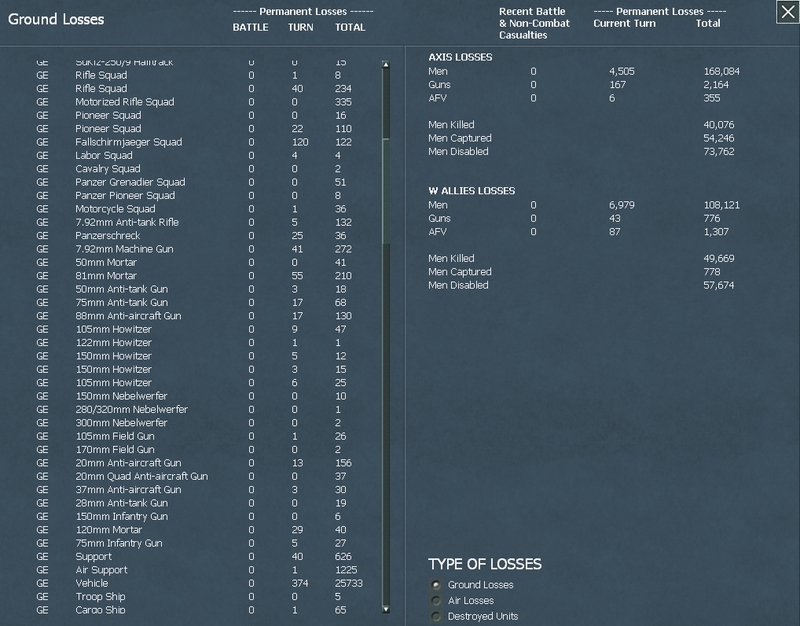 The HG Panzer Division has been relieved by the fresh 189th (Res) Infantry Division. In the south the enemy has advanced 10 miles after pushing back the Feldherrnhalle PzGren Division. 3 other subsequent attacks have failed as the PzGren Division has defended stubbornly. 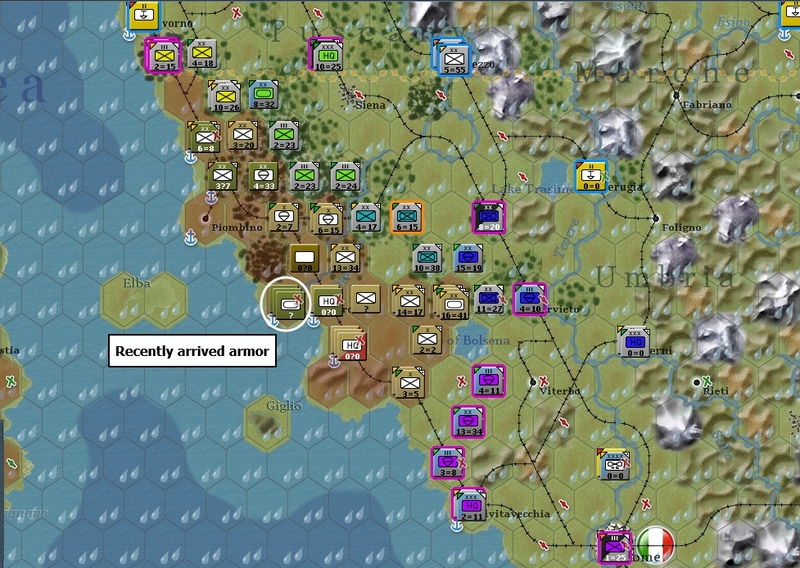 The counterattack of the 16th SS PzGren Division managed to save the day however, as without their involvement, the Anglo-Americans would have been able to break through further inland jeopardizing the entire defense of the Piombino sector. The Feldherrnhalle PzGren Division has been pulled off the frontline and has been transferred to a more quiet sector in order to recover from the losses incurred during the hard fought engagements of last week. 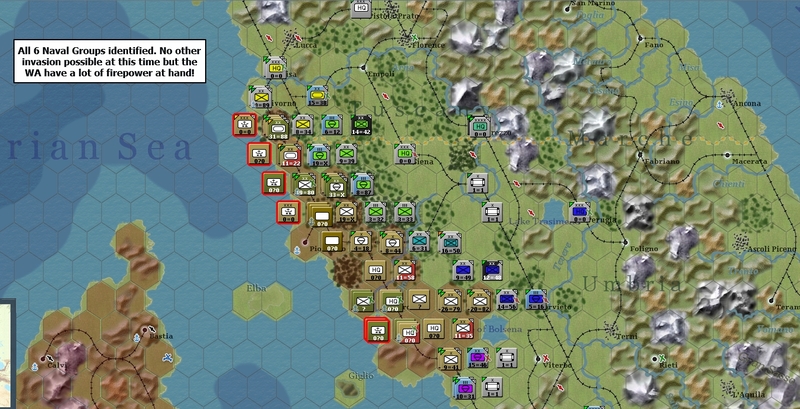 The spearhead of the enemy forces is made up of the 5th CA and 6th BR Armored divisions and intelligence reports that more armored formations have come ashore recently. See map 1, circled in black. See map 1, circled in yellow, first of the 3 holding battles. Feldherrnhalle PzGren Division TOE and new position. The sector north of the lake of Bolsena has been reinforced by the newly arrived LI Gebirgs Corps (dark blue) commanded by the experienced GL Hermann Balck. The 90th PzGren and the 2nd FJ divisions have been reinforced with independent AA and Panzerjager Battalions and are expected to hold back the WA assault in the area. The 16th SS PzGren Division and the 2nd Regiment of the 4th FJ division are acting in reserve. The situation in the Bifena Line is unchanged. The enemy has yet to undertake an offensive so our troops are holding their positions at the moment. Fortified Zones have been build behind the Volturno river, as we prepare new defensive lines in order to allow us flexibility once the situation changes. In the northern sector, regiments of the 15th PzGren Division have conducted long range recon on the enemy forces in front of our positions. They have discovered the 2nd US Armored division (broken down into regiments) and 2 other units which our intelligence has failed to identify. 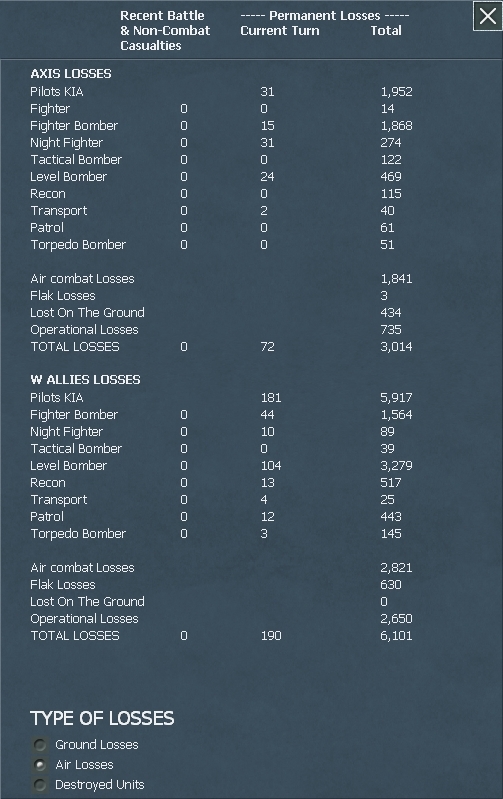 Note that while German casualties may seem high, at least 2k of them come from destroyed air support elements and are not riflemen as is the case for the WA. Status: offline Thanks for the comment Chama! 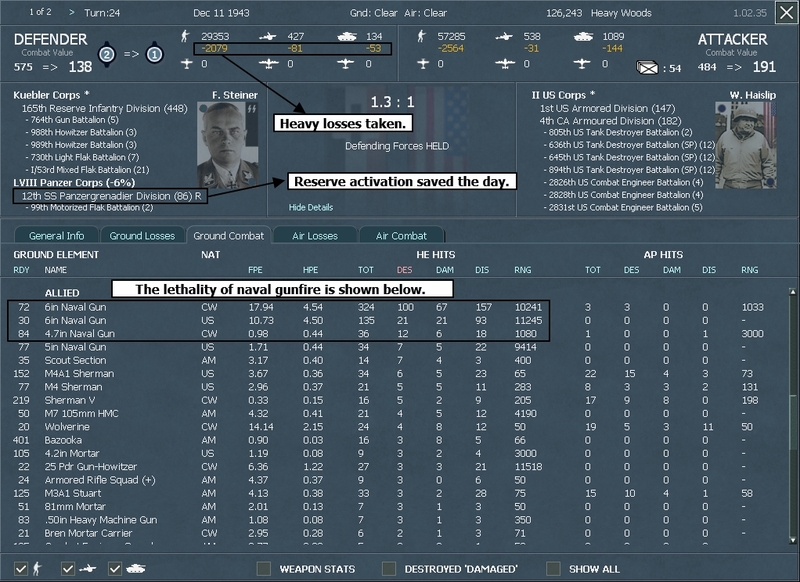 The 8th US Air Force has hit heavy industry targets in the Ruhr and Belgium this week. Most of their raids have missed their objectives and no heavy damages have been sustained. 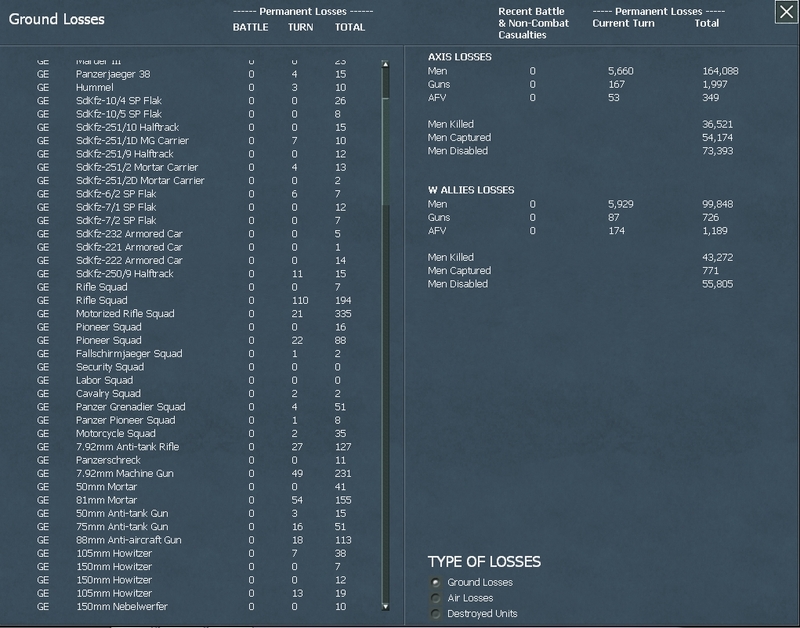 Operational losses for the enemy are high. Our fighters continue to be on the highest readiness in the north, awaiting for the enemy to strike the U-Boat pens. The enemy has undertaken no action against our forces this week. Their Air arm has been busy at work doing recon on our positions and airfields and protecting the shipping lanes that lead to Piombino. No activity on our side either as our bomber groups are still building up their strength and recovering from the losses suffered in the past weeks. Situation has been quiet on the ground too. In the Piombino sector the enemy has brought a lot of aircraft on the shore. The air groups will be using the airfields of the landing zones. The enemy has not followed through with any attacks but has repositioned their forces on the northern part of the landing zones, where 5 infantry divisions have been concentrated, ready to assault German positions. 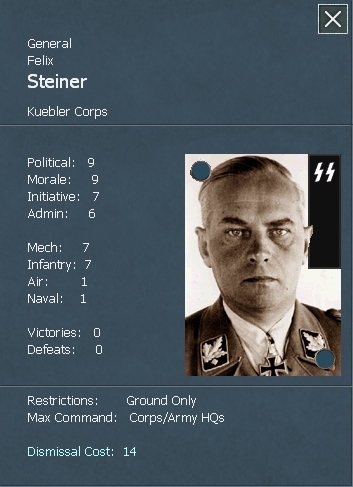 General Felix Steiner has taken command of the German units in this sector and is expected to hold back an enemy thrust in the area. In the Bifena Line things have been quiet as usual. 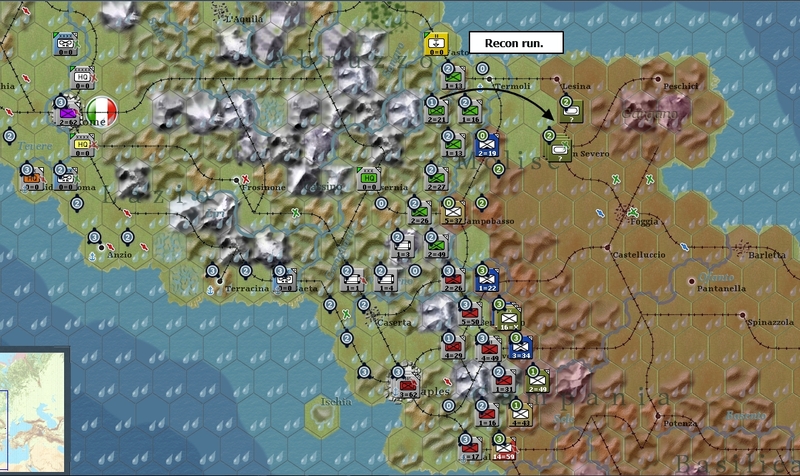 The fresh 188th Mountain division has recently arrived at Napoli and will soon take its position on the front line relieving the regiments of the 3rd PzGren Division. Status: offline when will there be a new update? I really don't know when there will be one or ''if'' there will be one. I emailed my opponent 3 days ago asking about the progress of the turn, but haven't received an answer yet. Will have to wait and see but will let you guys know about how things go. Status: offline Scrap that. Hghx-0 just sent the turn. I worried over nothing it seems. Stay tuned! Status: offline T23, 4th of December-11th of December 1943. Heavy rains over western Europe prohibit large scale bombings by the enemy. 3 small raids of little effect take place however. The bulk of the German fighters remains deployed in the north protecting the U-Boat pens. The enemy has not attacked our positions due to the strength of our defenses but has chosen to shift their attack point to the north. 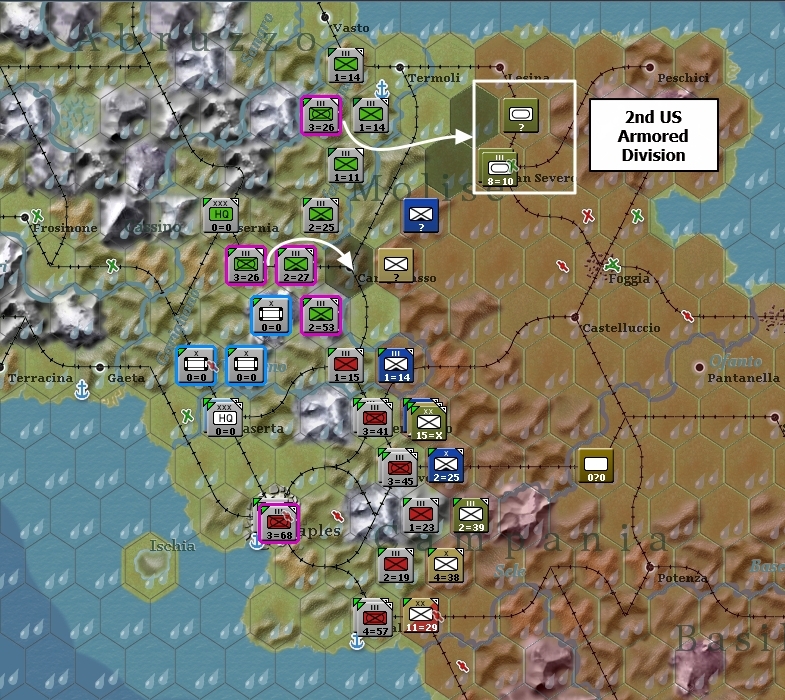 2 Armored divisions (the 1st US Armored and the 4th Canadian Armored Division) as well as 6 infantry divisions (among them the elite 82nd Airborne division) are preparing for an attack and eventual breakthrough. 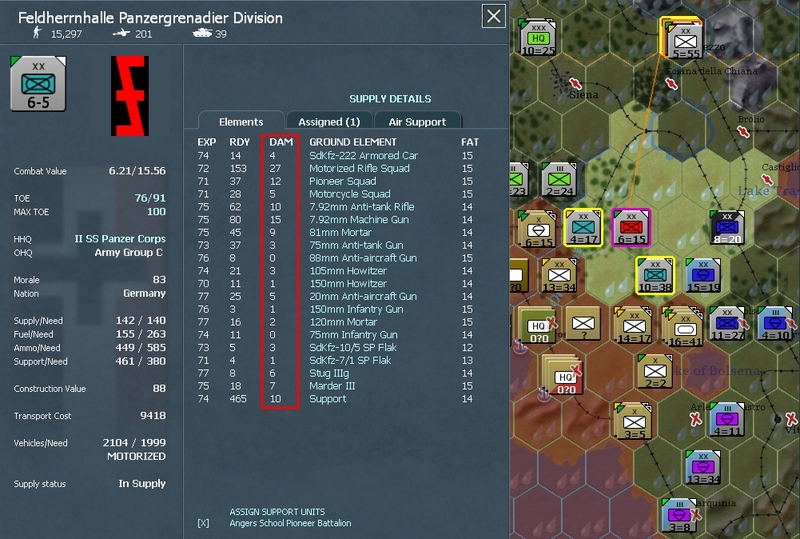 We have brought the 2nd FJ Dvision on the front and pulled back the HG Panzer Division to act as a reserve (the 12th SS PzGren Division is also acting as a reserve here). In addition to these measures, Luftflotte 2 has ordered Fighters and Tactical Bombers to support defensive operations. South of the Lake of Bolsena, our units have been ordered to make contact with the enemy, as fortified zones are building defenses in the rear. The enemy has deployed a high number of air assets to the beachheads. In the Rome area we have put the 349th ID to coastal defense of the ports west of the Italian capital. 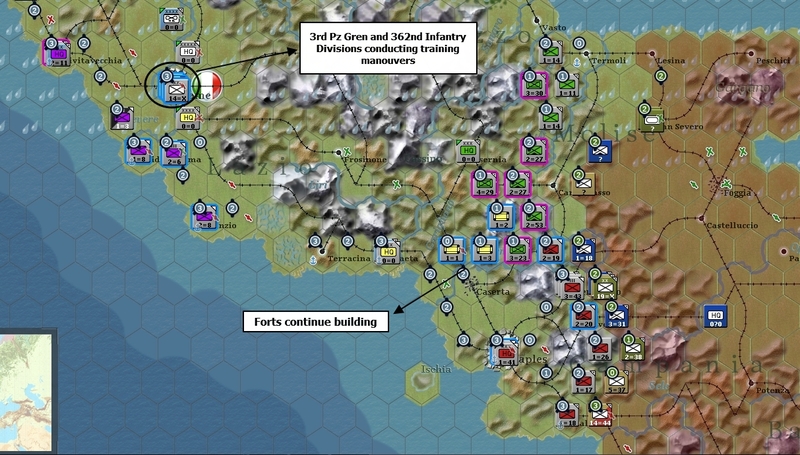 The recently arrived 362nd Infantry and the 3rd PzGren Divisions have been transferred to Rome and will deploy in defensive positions next week. In the Bifena Line we have just deployed the 188th Mtn Division to the front, replacing the 3rd PzGren Division. No attacks have occurred yet. Weather for next week is predicted to be clear so we expect increased activity in all sectors. Status: offline I just found this AAR and read it all in one go, it's so amazing! I'm really glad it is still going on! I just found this AAR and read it all in one go, it's so amazing! I'm really glad it is still going on! Thank you for all the nice words dcaflak. 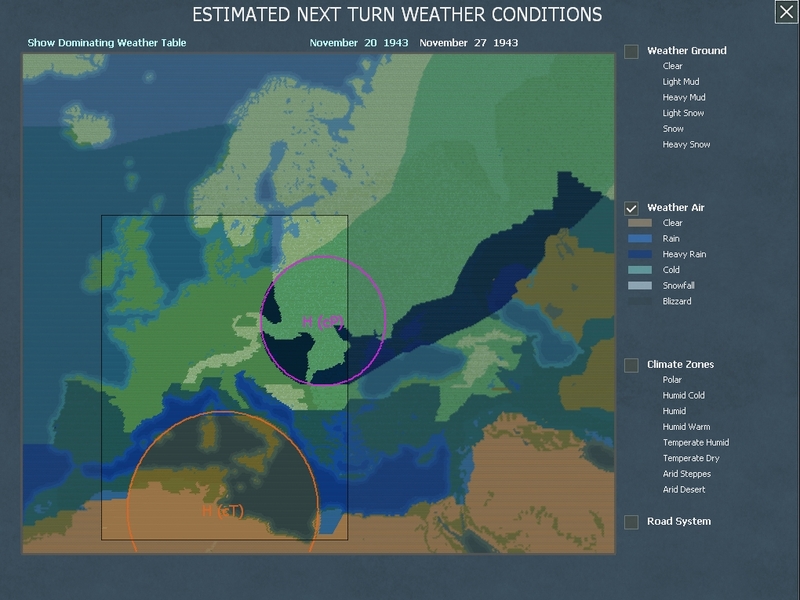 I intend to finish it so if everything goes according to plan, the game will continue till the very end of the Reich in 1945! Status: offline With the rain and resulting mud, your chances to bottle up the beachhead seem good? All while Napoleon's ghost watches the battle from Elba. 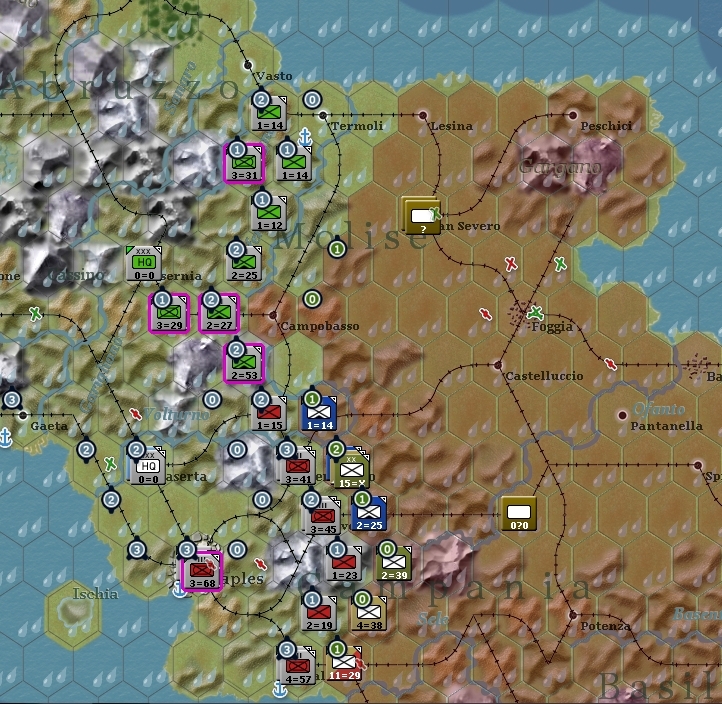 I am surprised that the Allies do not move a few units up to your mountain line to cause attrition. 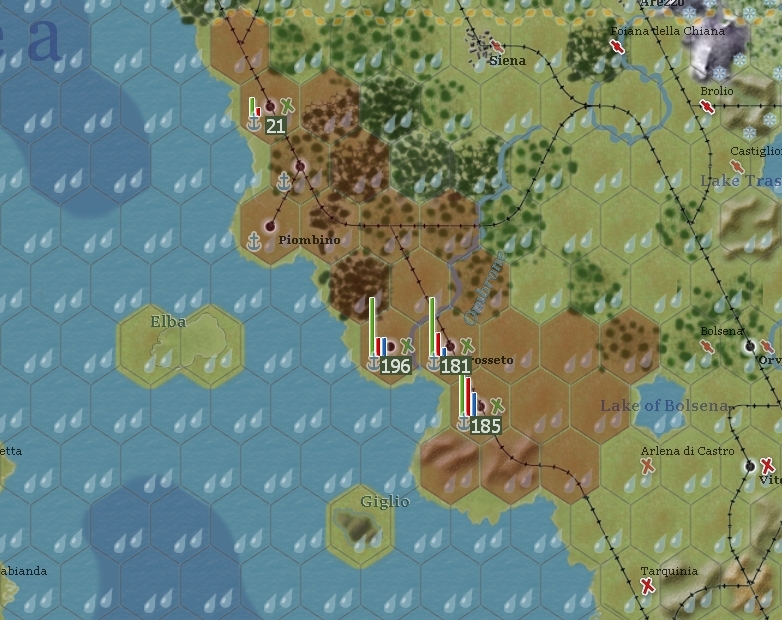 From what I have read, Axis supply during the Normandy fighting is severely restricted by Allied interdiction, is there anything in WitW advocating against building allot of Depots in the Normandy area in advance? How much of an issua are AP for the Axis side in WitW? With the rain and resulting mud, your chances to bottle up the beachhead seem good? The situation on the beachhead is ok for now but I expect a second invasion in the coming turns. And considering the amount of units in the beachhead, it will be a tough task to contain them even though we have done well so far. Well they don't seem intent in attacking there so by not making contact with my line they don't allow me to build up forts. WITW has a flawed fort requirement system where you need to be in contact with the enemy to build forts bigger than level 1. I did raise this as a issue here on the forums but got no reply whatsoever. Well I can name some things off the top of my head. First is the AP problem, you only get 5 APs a turn in the 43-45 Campaign as the Axis and those are needed for a lot of things (priority repairs, AA unit transfers, good leaders, depots in Italy, improving the existing depot system, building fortified zones etc). Secondly if you build a depot it will start pulling some trucks to have them if needed. So if you build 10 depots that you aren't using in France, even if they all have around 100 trucks in them you are denying yourself 1.000 trucks that could be used for other things. Plus you could do that in March-April 1944 and it won't make that big of a difference if you build them now. Right now I am worrying more about Italy and France is in the back of my head. I intend to do a full Report in the future about the whole process that is being done to fortify the coast and the strategy that Germany intends to follow but I feel that now is a bit too early to do so especially since many things have not fallen in place yet. The enemy hit industrial targets in the Ruhrgebiet last week. No action by our fighters as they remain deployed in the north, waiting for the Allies to take the bait and hit the U-Boat pens and Oil refineries near Hamburg. There are 1.100 day fighters deployed in the sector. The enemy ran large scale recon and naval patrols in Italy last week. 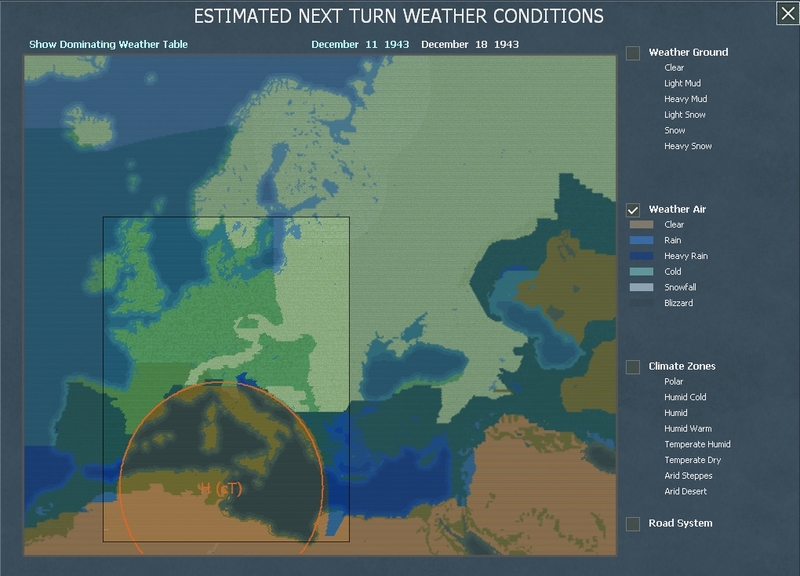 They now have full control of the shipping lanes even going so far as to control the routes west of Rome. 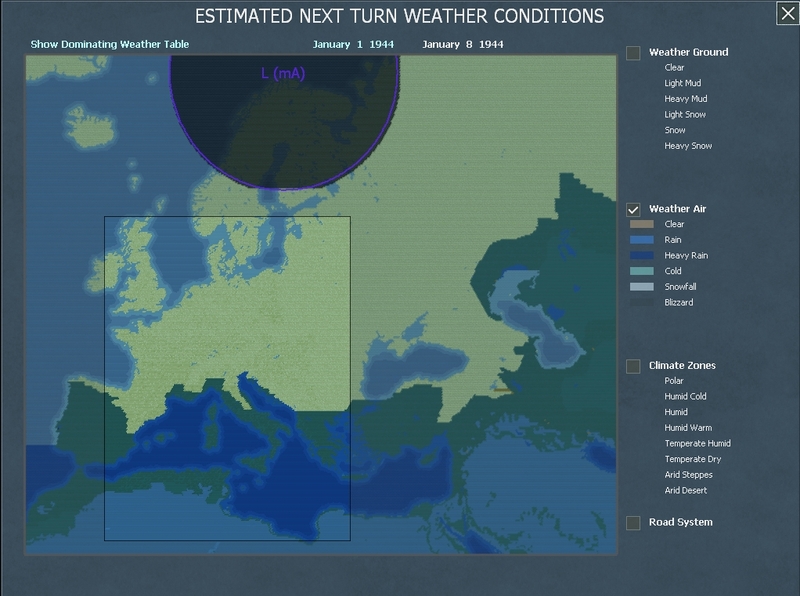 Luftflotte 2 has been tasked with clearing the shipping lanes in order to prevent a invasion on Rome. We have unfortunately lost the services of the Feldherrnhalle PzGren Division. Their place has been taken by the 334th ID which was deployed to the front this week. The enemy seems to have brought fresh forces into the beachhead. The amount of men and material in this sector is absolutely impressive. The equivalent of 2 Field Armies are deployed here, and our recon and intelligence services have detected at least 5 armored divisions. Moreover, it appears that the enemy has deployed all of their Naval Groups in here (4 of them are confirmed, 2 suspected). Seeing the deployment of the enemy forces, we decided to reinforce the positions held by the 189th Reserve ID by transferring elements of the 2nd FJ division in that sector. The fresh 719th ID that has been safeguarding Bologna was sent to the front as well. The HG Panzer Divison, 1 Regiment of the 2nd FJ Division and the 12th SS PzGren Divisions remain on reserve near the front here. Orders have been sent to start building fortified positions for us to retreat to in case of a WA breakthrough. The Rome defensive line was reinforced after the deployment of the 362nd ID. The 3rd PzGren Division is acting as a reserve in the Italian capital. LXVII Corps has taken over the defense of the sector. In the Bifena line, nothing has changed. We moved 2 mechanized regiments of the 15th PzGren Division near the city of Benevento in order to prevent a possible attack. The enemy hit industrial targets in the Ruhrgebiet again last week as well as major cities in Belgium. Our fighters remain deployed in the north and await the enemy to strike attacks there. The situation in Italy changed this week as the enemy finally made a strong push out of the beachhead striking north towards Livorno. The wrath of the enemy fell on the 165th Reserve Infantry division protecting the heavy wooded terrain south of Livorno. The division was bombed from the air relentlessly and our attempts to intercept the bombers wielded little results. The WA also had the advantage in firepower, as they were being supported by naval gunfire from 4 Naval Groups firing from the coast. Nevertheless, the 165th Reserve ID managed to hold off the first assault by 2 Armored and 1 Infantry divisions, thanks to the arrival on time of the counterattacking 12th SS PzGren Division. On the second assault they were forced back and there was little anyone could do to prevent the enemy from taking the position. Heavy losses were taken on both sides and the 165th Reserve ID has been pulled to the rear as their ready TOE has dropped down to 60%. 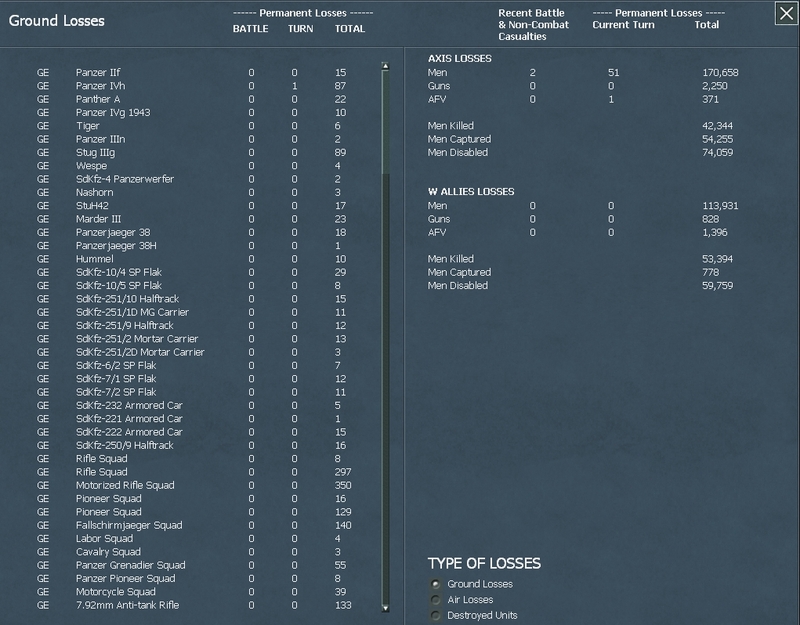 Heavy losses on both sides this week due to fighting in Italy. Notice the destructive effects of Naval gunfire. 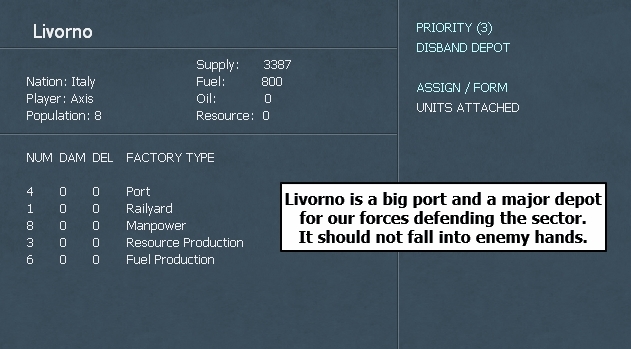 Recon and intelligence has now confirmed that the enemy has deployed all of their Naval Groups in the Piombino sector, so there is no risk of another invasion taking place in other sectors. With that thought in mind, Army Group C ordered the 1st FJ Division to move north as they were relieved by the arrival of the 362nd ID that was guarding the beaches west of Rome. The 3rd PzGren. Division also left their quarters in Rome and was transferred to Florence. Other units were moved closer to the front so as to reinforce our positions. The main objective for now is to prevent the enemy from capturing the port of Livorno which would allow them to improve their supply situation considerably. 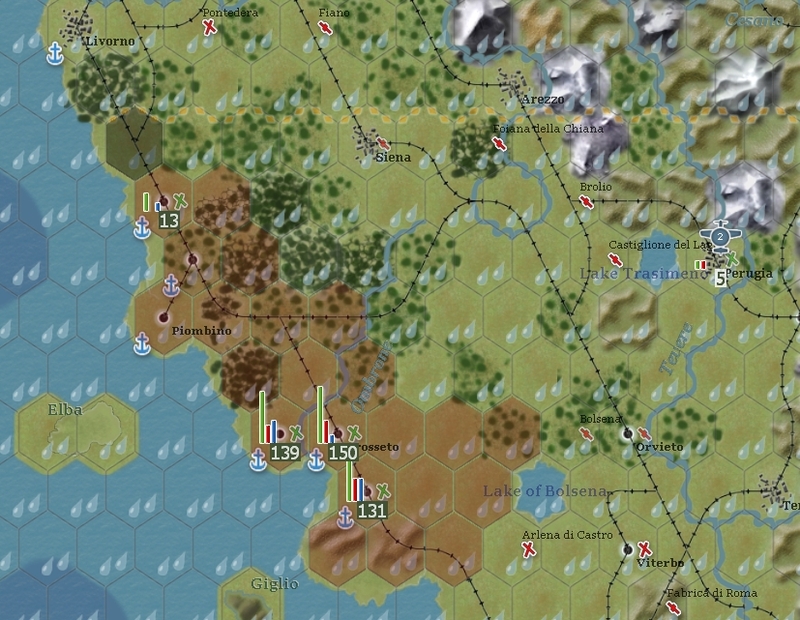 2 full strength Infantry divisions, reinforced with AA and AT battalions have been tasked with holding the port and the battle will surely get bloody. Weather predictions for next week are rains, so the onset of light mud might hinder enemy operations in the area. In the Bifena sector, the enemy has finally made contact with our defensive line. Nothing else to report from here at the moment. 1) The first is that the power of the Naval Groups should not be underestimated. Seeing the detailed battle report makes you respect the ability of naval guns to not only destroy elements but also to damage and disrupt them. As such, the WA player should use them whenever it is possible and the Axis player should try to avoid them when possible. 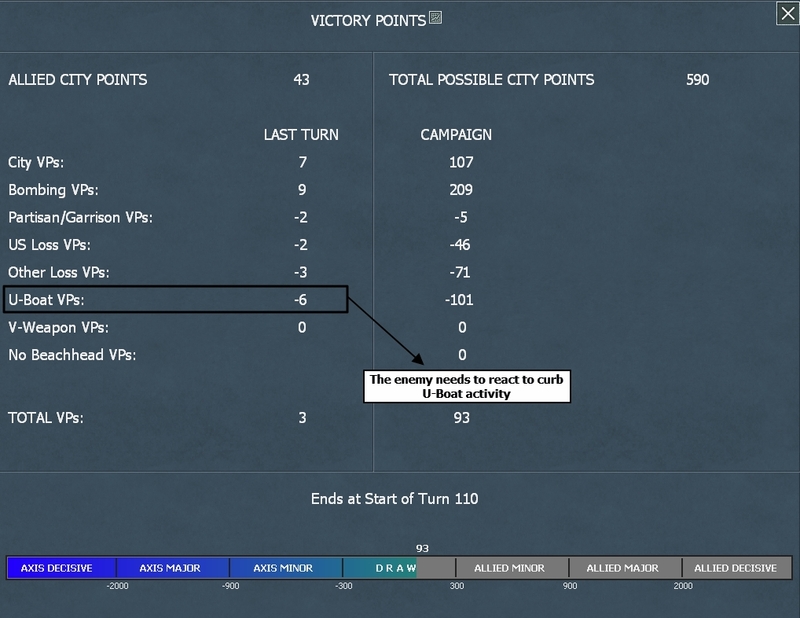 2) One of the mistakes that my opponent has done is deploying all 6 of his naval groups to the beachhead. One of the most powerful weapon the WA have in the game is their ability to dictate where the battle is fought and where they land. 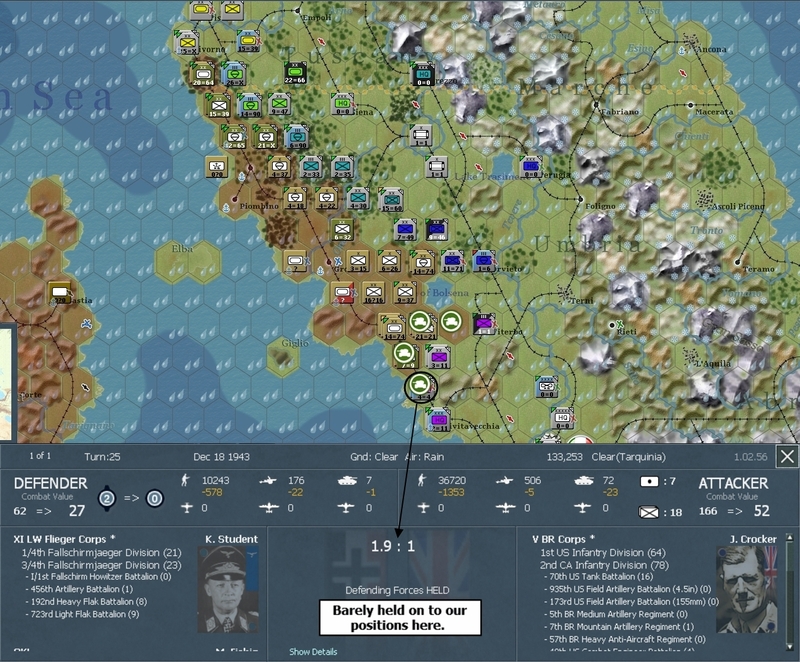 Keeping the Axis player on their toes, unsure about where/when the WA will launch a second invasion is a very powerful tool as it means the Axis player cannot deploy all his forces to a certain sector as he has to keep reserves in case of another landing. 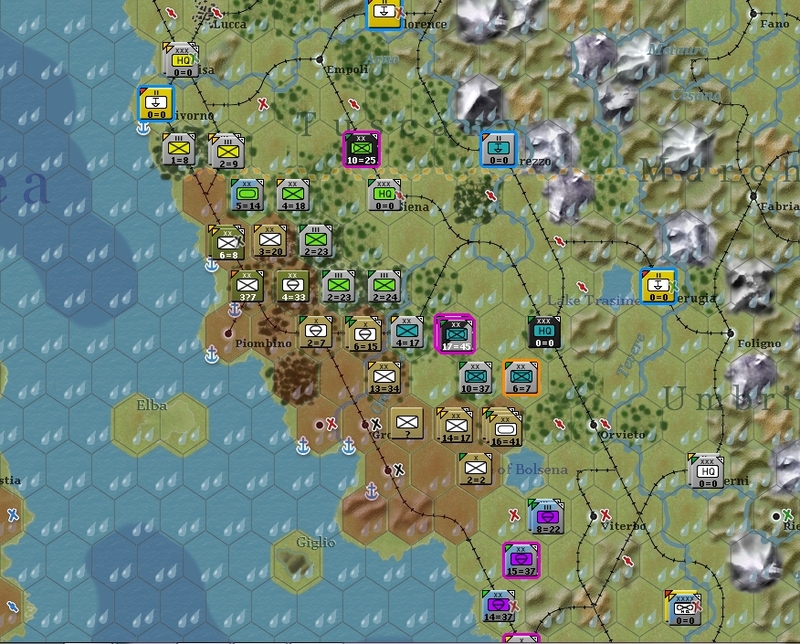 I have been worrying about another invasion for a couple of turns but seeing that the enemy has deployed all 6 Naval Groups there allowed me to move reserves to other parts of the front and that will make the advance of the WA player harder. Even if there was no second invasion, just hiding 2 Naval Groups would be enough to keep me guessing. So my advice to WA players would be to never deploy all 6 of your Amphibious HQs for an operation and to always leave the Axis player guessing. Status: offline Your opponent may not be aware that Amphib units can take care of all adjacent beaches; he doesn't need more than 2 Amphibs for that whole bridgehead. That is a major error. The other issue here is that he "broke" the N. Italy Zone, which really simplifies your defense. Sticking to S. Italy you can stretch the Germans out more. Instead of attacking north toward Livorno, I would've attacked due East past Lake Bolsena. Yes, there is no port that way, but if you stretch the Germans enough they will break, and the only choice at that point is a withdrawl to Gothic Line. 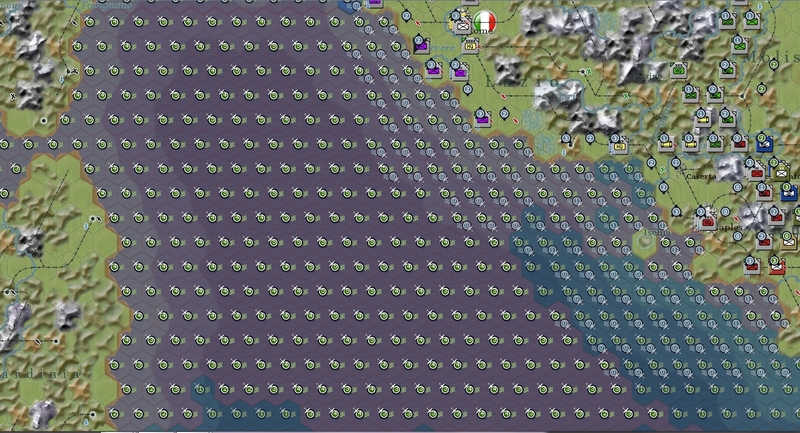 Your opponent may not be aware that Amphib units can take care of all adjacent beaches; he doesn't need more than 2 Amphibs for that whole bridgehead. That is a major error. I agree with you Q-Ball. He needs 2 Amphibs to hold the beachhead and maybe could keep two more to increase fire support (4 amphibs HQs) but should have planned another invasion with the other 2 or just kept them in reserve to keep me guessing. Yeah I am glad he did that. Now I don't have to hold the silly garrison CV that the game requires and makes the defense easier. Although I must say that not attacking there just because of the Garrison rules is kind of gamey. 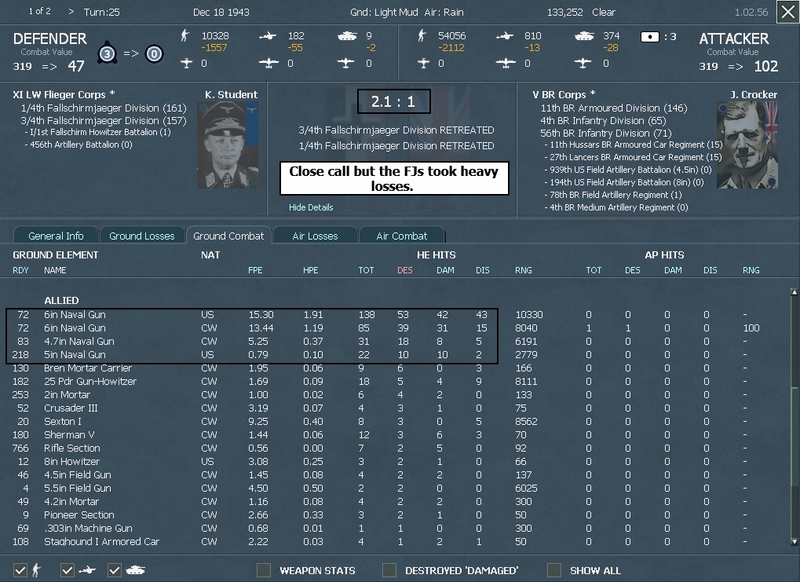 Attacking towards Livorno is not a bad gamble in my opinion, but he needs to break out of the beachhead soon. Well he did try to break past Lake Bolsena and it failed so I guess he is being cautious and doesn't wanna risk that bloodbath again. I also think he should be putting a lot more pressure in the south and at least push to capture Salerno. I will let my opponent know about the Amphibious HQ thing as he may not be aware of it. But like a wise man once said, don't interrupt your enemy while he is making a mistake. 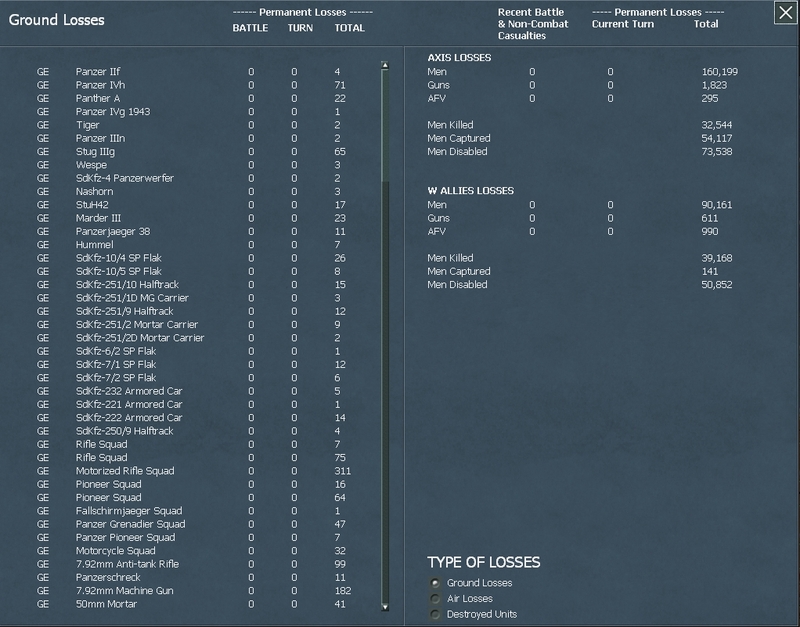 Status: offline I am surprised your opponent did not attack the exposed 3=32 regiment. It seems like a vulnerable target and a hole there threatens a breakout into the empty terrain. Does your opponent have supply problems and want to save readiness? Naval guns really look deadly. And it looks like the really big naval guns were not even involved. Are 10inch+ guns part of naval groups later on? There were some bigger ships involved for D-day. Status: offline Ouch, so the landing is north enough to count as northen italy, and therefore all normal garrison requirements are gone? And since there will be no new invasion that means that essentially all reserves in Europe can be used against this beachhead. Are you still doing navalinterdicition with your bomber fleet to slow down supply? What do you think are your prospects for containing this invasion? Hope this AAR will continue. Status: offline @EvK: He made a really nice move that I will cover in the next report and attacked south of Lake Bolsena. Really messed up my defenders there. As far as I can tell he is not having any supply problems which I honestly find unrealistic considering that all these units (and around 300+ planes located in the beachhead) are being supplied from a level 1 port and the landing beaches but maybe I am wrong and he is indeed struggling for supplies. AFAIK 10 inch naval guns are not modeled in game, the biggest caliber are the 6inch ones but they sure know how to pack a punch. @Chama: Yes and no. 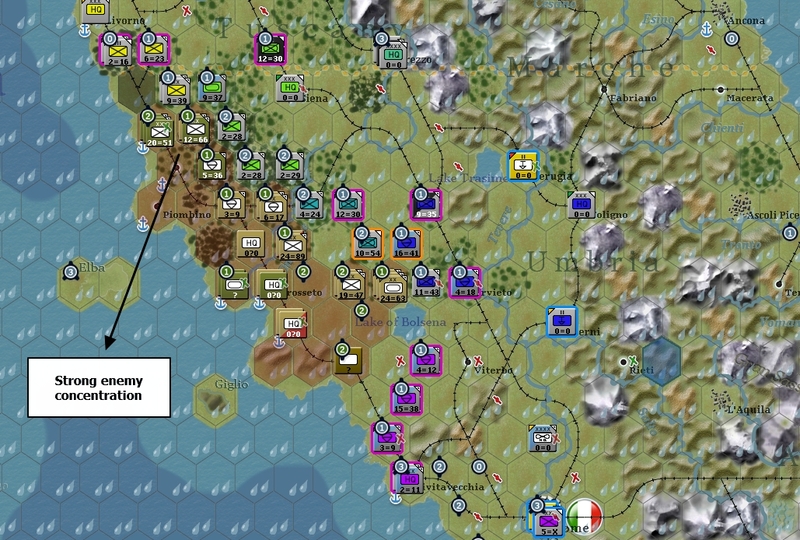 The landing itself was not inside the boundaries of the garrison for Northen Italy, but his attacks of last week crossed the line and that allows me to free up units in Northern Italy for the defense. 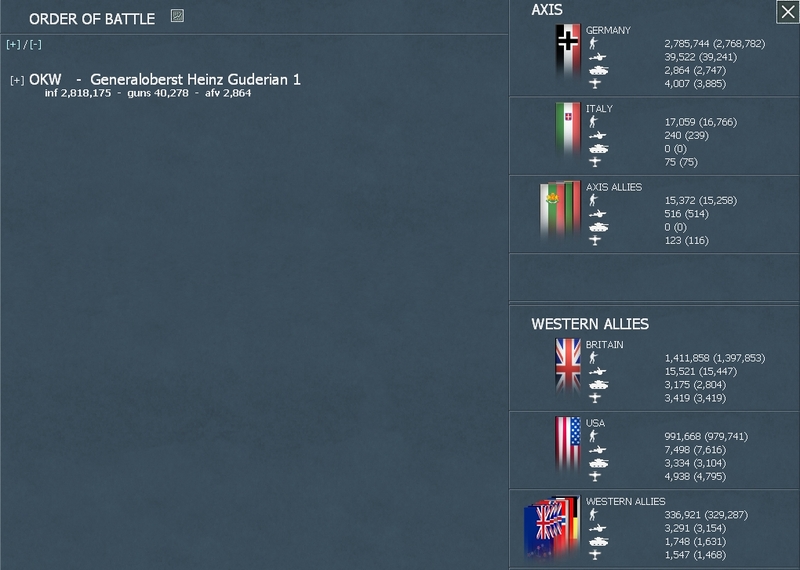 I still have to keep all other garrisons in Europe though, so only very few units will be free to join the defense. I stopped NI for a couple of weeks but launched one lately. You will see the results in the next update but it did not go well for me. 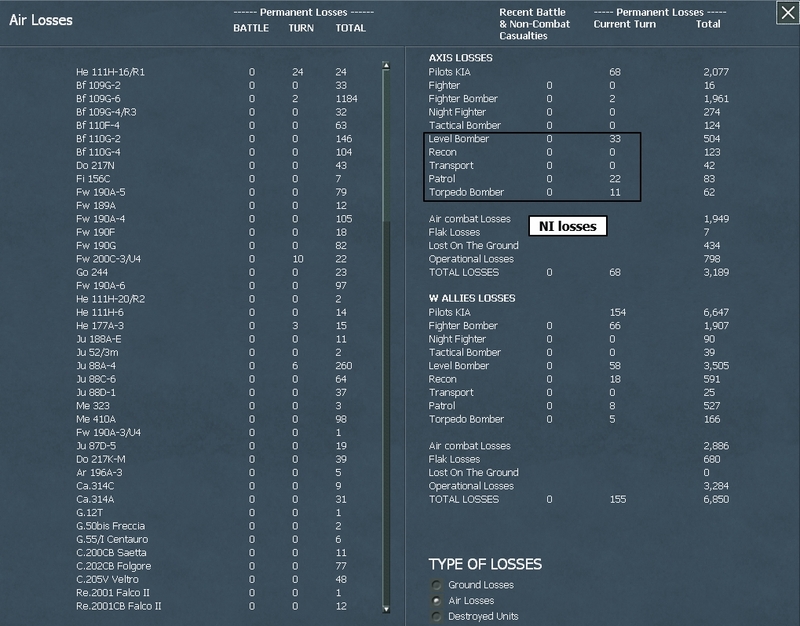 I lost around 66 bombers and I don't like such heavy losses for little gain. Will probably stop NI alltogether at least for some more weeks. Honestly the prospects are not looking really good right now, the enemy has a lot of forces in the beachhead and doesn't seem to be suffering from supply shortages (or men and material for that matter). I wish the weather would help me a bit but so far I haven't gotten very lucky. I hope we can prevent a breakthrough till summer like the Germans did historically but will have to see how that plays out. The AAR will continue so stay tuned! Naval Interdiction patrols that we launched during enemys turn last week failed to cut off the shipping lanes and suffered heavy casualties as they were intercepted over central Italy by British fighters. We will discontinue our efforts to cut the enemy supply lines off and have pulled back all bomber groups to northern Italy and Germany. The enemy changed their attack direction last week and caught us by surprise. 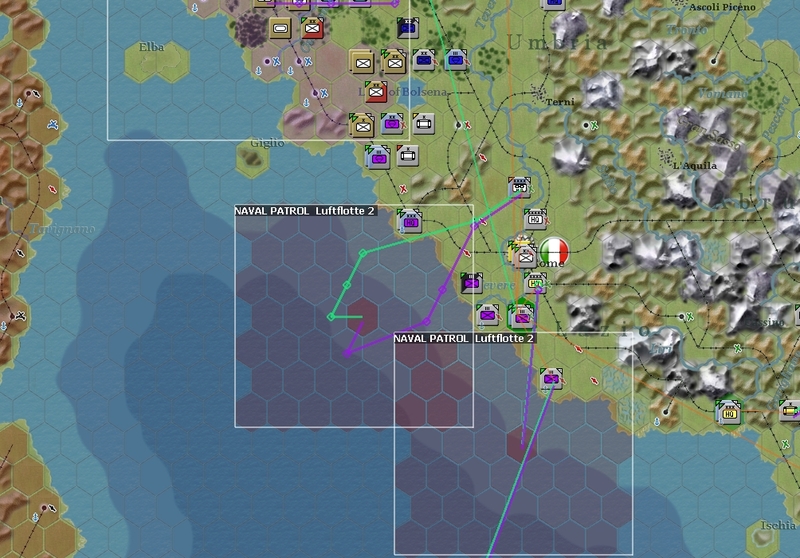 The WA chose to strike south of Lake Bolsena, a sector that we had recently weakened in order to push new reserves to the north. The enemy launched 4 attacks, 3 of which were successful. The worst units hit were the 2 regiments of the 4th FJ Division defending the coast. Again the naval guns from the enemy warships caused the most damage as shown below. Fortunately for us, the battle hardened regiments managed to hold a secondary attack just north of the port of Civitavecchia. Seeing how the 1st US ID and the 2nd CA ID were quite weakened by the battles of last week, the LI Gebirgs Corps under the command of GL Hermann Balck launched a strong counterattacked that pushed both of these divisions back and caused heavy losses to the enemy. Nothing has changed in the Bifena Line. We did a recon run in order to identify the enemy formations present near Foggia and did not detect any new units. Status: offline T27, 1st of January 1944-8th of January 1944. 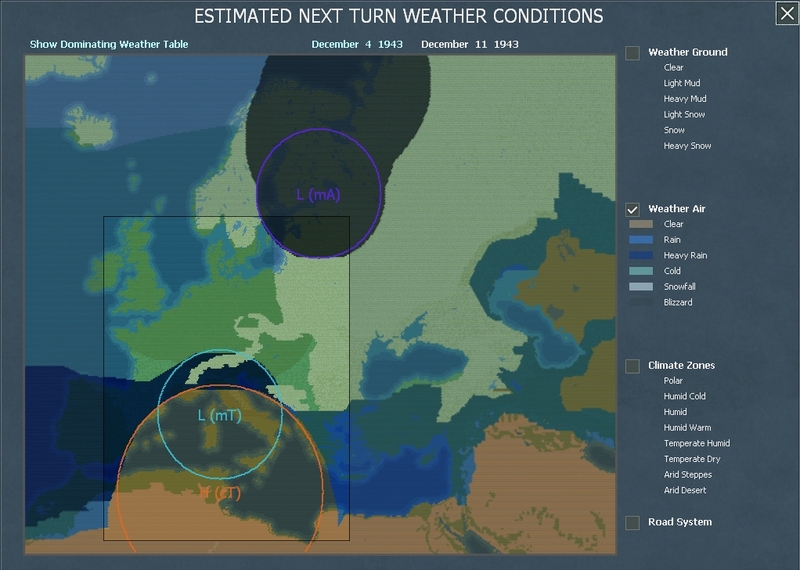 Heavy Snowfall over the Reich has caused the WA to cease their bombing offensive save for some small raids over Belgium. Our fighter groups are enjoying their long vacation and we even have a surplus of 102 trained pilots in the pool. We intend to increase those numbers and avoid unnecessary clashes with the enemy. After an intense bombardment from the air (36 air raids), the enemy launched a strong attack south of the Lake of Bolsena and pushed our forces back. They British took heavy casualties in the process. We have reinforced our positions south of Lake Bolsena and more reinforcements are expected to arrive soon. The enemy is putting heavy pressure on us and slowly capturing ground. 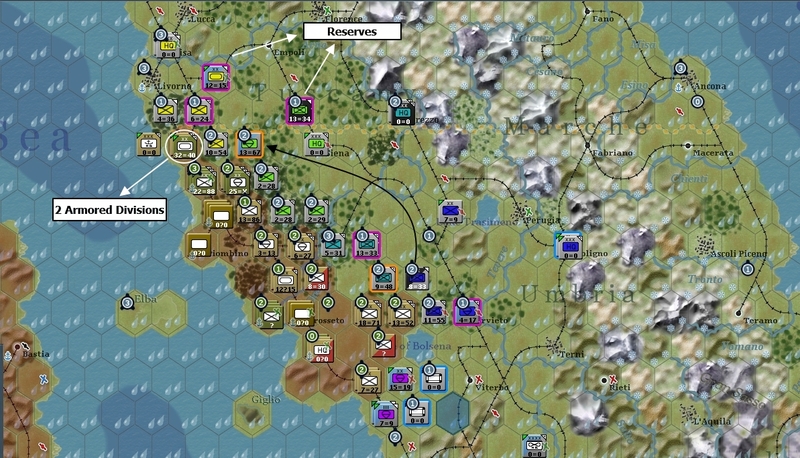 The departure of the elite 2nd FJ division means that the northern part of our defensive line is weaker now and the WA can exploit this weakness to breakout. Positions after German moves. WA armored formations are displayed. The 5th Mtn. Division has arrived in Napoli and will be deployed on the frontline soon. The 15th Pz.Gren Division will be reformed next week and will be held in reserve as 1 strong mobile formation. 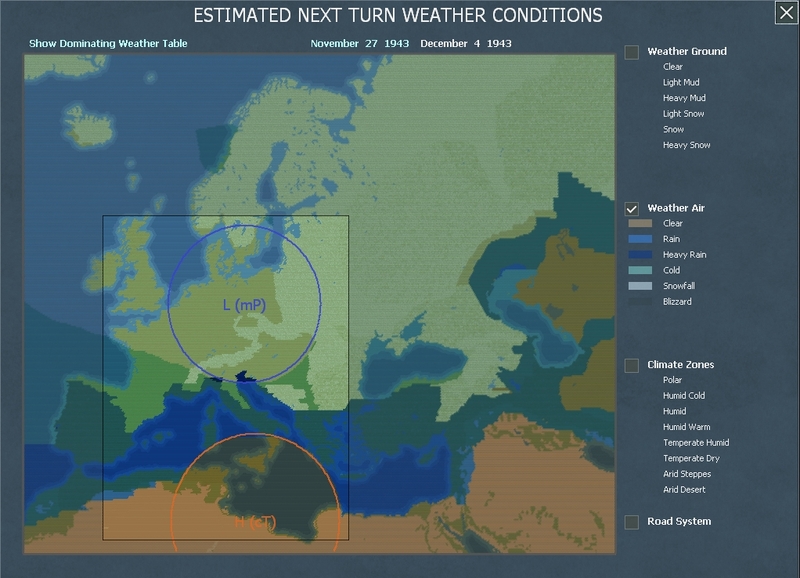 Snowfall over the Reich next week should prevent the enemy from launching bombing raids while the weather over Italy will be light rains.